Milwaukie beaver removal provides beaver control, flood control, tree damage control. Beaver can be very difficult to control when in urban areas because of the location and activity of other animals and people in the area. We have over 30 years of experience in solving beaver problems in Oregon and are ready to help solve your problem. When beaver's back up water it can cause serious flooding damage and erosion which looses property. When trees are cut down and killed this can also cause erosion because the root base helps keep the ground together. 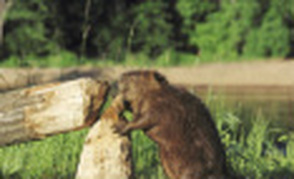 When solving beaver problems there are a few different methods, but overall the most effective is usually to remove the problem beaver and remove the dam. This is the quickest way to stop tree, property, and other damage from happening. If you have a beaver problem give us a call and we can talk about getting it solved. For Milwaukie Beaver Removal Call 503-201-2432 Today!